I confess that I do not know what this means, but it has been a text that I have read with a mixture of hope and skepticism. The skepticism arises from living in a material world which consistently promises more than it can deliver; in fact, more than it contains. The hope arises because whatever it means it’s a pretty good bet that it has little, if anything, to do with material things. But the intriguing thing about this text is how our interest rises upon reading it — and then how we sprawl, puzzled and rubbing our heads where we bumped them on the low ceiling of our expectations. In a culture as resolutely acquisitive as ours, where everything has an instrumental worth in the pursuit of happiness, a quick default reading of this for a lot of us will no doubt mean that abundant life means abundant wealth. The operating manual for life in an upwardly mobile society has been written by advertising and marketing firms. We are trained from an early age to see a direct line from desires to goods to possessions to happiness. Many thousands of people bend the resources of their minds and energies to create the shortest possible distance for us between desire and happiness. But it’s the stuff in the middle — goods and possessions — that derails the end product of happiness. The very idea that happiness is the expected product of desire fulfilled has been a philosophical question for as long as people cared to reflect on their inner lives. Aristotle devoted most of the Nicomachean Ethics to it, to what he called eudaimonia, usually translated “happiness,” but more closely thought of as “flourishing.” A life of virtue, resulting from seeking and practicing that which would fulfill one’s calling to be fully human was Aristotle’s aim. The Epicureans, wholly misunderstood as hedonistic party animals, taught that a simple life of tilling one’s garden in the country and living minimally was the best route to satisfaction. Epictetus and the Stoics thought that our attitude toward the rough-and-tumble of life determined our happiness. There has been no shortage of advice, devices, and methods for achieving happiness, through wealth or other means. But this is not what Jesus is talking about with his above-and-beyond abundance of life. This short text is embedded in a longer passage about sheep, gates, sheepfolds, thieves, predators, bad shepherds, and a good shepherd (John 10:1-18). There is no mention of money or wealth. There is plenty of talk about true voices and the laying down of a man’s life. The passage begins with a warning: everyone who climbs over the wall into the sheepfold is a thief and a bandit. Only the shepherd goes in through the gate. Once in, he calls out the sheep and they follow him because they know his voice. They don’t know the voices of strangers and they won’t follow a voice they don’t know. There are many people who would like access to all those sheep. They come dressed in shepherd’s clothes; they might even carry a staff. They wouldn’t bother to pick off one or two here or there: they would want the whole flock. They want the whole flock, because the bigger the flock, the greater their status. The first thing this parable teaches us, then, is that if you want to lead the sheep you’ve got to go through Jesus to get to them. No climbing over the wall or tunneling under or breaking in or removing the gate. Those who do so are thieves, bandits, and predators who come to break and destroy. They are not shepherds. This may include those who came to the sheepfold with the best of intentions, but who found entering by the gate to be an obstacle and an impediment. They are impatient to play the shepherd, to lead a large flock, to call the sheep and watch them come running. They talk at length about their sacrifices, shed tears about the cost of upkeep, proclaim themselves humbled by how awesome they are, and congratulate the sheep on having a shepherd who truly, deeply, cares. Then they go around the back and try to climb over the wall. If you're a hired hand — one who came in through the gate and not over the wall — it’s going to take some time for the sheep to get to know your voice. Hired hands are usually there for the season and then gone; it takes time to build trust, even with sheep. Hirelings must have been known for their unreliability or the mention of one would not have evoked knowing nods and grins. If the hireling does not have the trust of the sheep he must harass and coerce them into moving where he wants them to go. They are listening for the voice of the master. If they do not hear it they will not be compliant. The sheep in this story are not easily fooled. They know the master’s voice and they will not follow just anybody. Here is definitive proof that in this regard, sheep are smarter than people. But if the sheep know and love and trust the shepherd they’ll move because they want to be with the shepherd. Love and trust over fear and coercion. When we see Jesus holding a lamb in his arms in countless stained-glass windows, there’s a Teflon factor working on us. We register the image: Jesus, tall and stately, a lamb nestling in his arms, safety at hand — it’s a smooth and impervious surface, rather sweet and sentimental, truth be told, and ultimately forgettable. 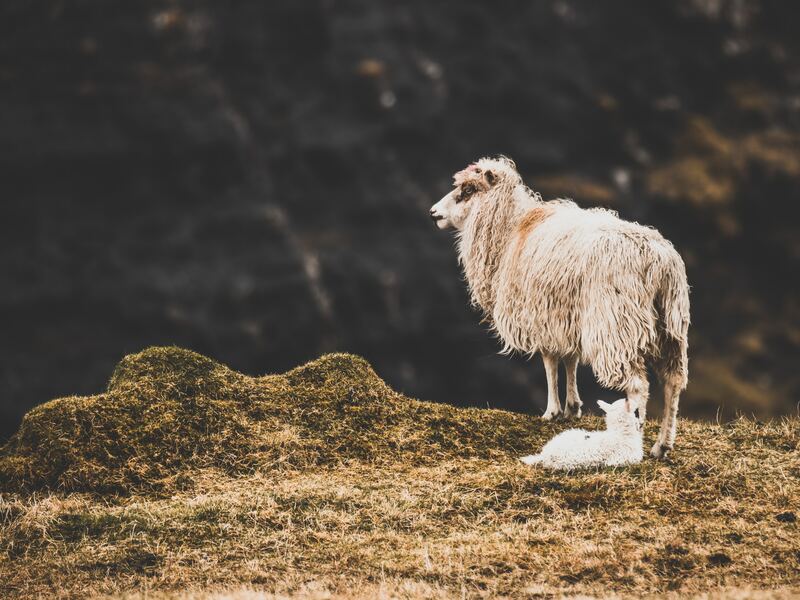 What we don’t see on the surface, but what Jesus’ listeners would have understood instinctively, is how the shepherd is a leader, someone with authority as well as interest, with power as well as love. In a dry and lean land, with scarce resources and danger afoot, the analogy of a shepherd protecting the sheep is common sense, part of the fabric of one’s life. A shepherd, a good shepherd, stays and fights for the sheep, even at risk to his life. The Good Shepherd not only has an interest in protecting his investment, but far more consequentially, he loves the sheep and they love him. The Good Shepherd is good not because he leads the sheep — even the hireling is expected to do that — but because he’ll lay down his life for the sheep. We are so far removed from sheep and shepherds that what was common and core to everyday life back then is for us a quaint and awkward symbol. We don’t think of ourselves as sheep, passively following someone over hill and dale. We are moral agents in charge of our own destinies. Moreover, if we did belong to a particular sheepfold it’s because we chose to and we could just as easily unchoose. We might even remove ourselves to another sheepfold or just go off over the hills. We do not see that this is about life and death. In an atomized society such as ours, with our comparative wealth and ease, we may not find the comparison to sheep persuasive. It might even be offensive. It certainly offended the Pharisees. This is an encounter in which Jesus makes claims that are bold even for him. And here is where the light sweeping across a verdant field darkens and those who hear his voice pause with caught breath as he says, “I lay down my life in order to take it up again. No one takes it from me, but I lay it down of my own accord. I have power to lay it down, and I have power to take it up again.” It is a taunt against the powers that be, the ones that break in and steal and destroy, the ones who will strangle the breath out of the voice that calls to the sheep. If there is life it is because of the shepherd, and if we have abundant life — extravagant, pressed-down-and-running-over life, life which cannot be crushed by death — it will be so because we heard the voice and followed the one we love. Barry Casey taught religion, philosophy, and communications for 28 years at Columbia Union College, now Washington Adventist University, and business communication at Stevenson University for 7 years. He continues as adjunct professor in ethics and philosophy at Trinity Washington University, D.C. More of the author’s writing can be found on his blog, Dante’s Woods.